If you're experiencing stress or you find yourself tense all the time, then you need to identify and understand what's causing it and then you need to introduce ways do begin to reduce it. But before you set about reducing your stress, it's important to distinguish what's a beneficial amount of stress and what's excessive and harmful. We all need a little bit of stress to get us motivated and to push us to leap out of bed in the morning, it is also beneficial in short burst to help us overcome challenges and to perform better in certain activities. What is harmful is when it is prolonged and you reach a point where you find it hard to relax, cope and function efficiently. When things are going well for you, when you are eating healthily, you are sleeping well and you feel content and relaxed then you will find it a lot more easy to cope with life's pressures and challenges than you would if you felt tense, on edge all the time, tired, frustrated and over stressed. When you're stressed it means you have shifted into a physical and mental state where you are feeling more pressured, this can be how you're responding to real life external circumstances and events or internal imagined situations. So your stress can be triggered by the way you're reacting to environmental situations or if your worried about something happening. The good news is you can start to change the way you respond to and deal with all your stressors (situations that are provoking your stress) both external and internal, this will leave you more able to cope with and manage life's challenges in a more calm and controlled manner. The majority of your stressful responses will be caused by external circumstances and how you choose to respond to what happens around you. However a lot of long term stress is stimulated by your internal perceptions and worries, internally driven stress can be evoked by negative thoughts and a poor self image of yourself, but it can also be triggered because you're already in a anxious, tense and stressful state. Long term stress can result in you becoming trapped in a cycle of panic and anxiety because of the fact your body is stuck in the fight or flight mode. You will probably find out once you learn to calm down and relax, then the things that once caused you to respond stress fully will no longer bother you as much. Your personality, your self esteem and your confidence levels can all play a role in how you cope and deal with life's challenges and ups and downs. If you are the confident and extrovert type you will find it more easy to deal with new challenges and social events than you would if you were more of the anxious and negative type of person. Confident people do not shy away from being the center of attention and they are more likely to cope better in new and challenging experiences. People who are calm, lay back and take things in their stride also cope better with stress, so your ideal state should be calm and confident. Once you have identified and you fully understand and recognize what's causing your stress, it is not that difficult to learn how to reduce it and eliminate it. Many people come to rely on alcohol and drugs to manage their stress, however, these methods only give temporary relief and they are bad for your health. The key is to pinpoint the triggers, first you have to ask yourself, is your stress a internal response to your negative thoughts and your low self image of yourself or are you reacting badly to external situations, most times it is a combination of both. It may help you to carry a note pad with you and then jot down any thoughts or circumstances that have triggered a stressful reaction. 1) Deal with your worries. Worrying all the time is sure to increase your stress levels and it will make you feel more anxious. If you have a problem instead of going over and over it again in your mind, accept what is and then deal with it or search for a solution, once you have done everything you can let it go. 2) Dismiss any negative thoughts. Negative thinking is the curse of modern day living they will also cause you a lot of unneeded stress, the easiest way to deal with negative thoughts is to just dismiss them and ignore them every time they enter your mind. Sometimes it may help if you replace them with a more positive statement, but certainly give them none of your attention. Learn to face your fears and take on new challenges, avoidance tactic will only lead to more anxiety and stress. 3) Medical options. It may pay you to visit your doctor, short term medication may benefit you or seeing a counselor can help some people to perceive their problems from a different perspective. Some people feel better by just talking to somebody about their issues. 4) Learn to relax. Relaxation is the big anti-dote to stress, making the effort to spend about twenty minutes per day learning to relax deeply will greatly reduce your stress levels, once you are more relaxed you will also find you sleep better, you will have more energy and you will cope and handle stressful situations far easily. 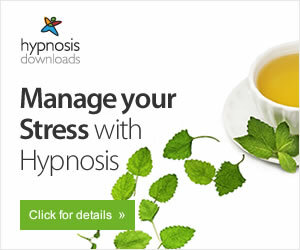 The best forms of relaxation on hypnosis and meditation. 5) Learn to breathe deeper. When you become stressed and tense, your breathing will become shallower and more rapid, learning to control your breathing will soon return you to a more relaxed and balanced state. Every so often throughout your day, practice some rhythmic breathing, this is where you breathe from your belly instead of your chest. The out breathe should be longer than the in breath, a typical technique would be, in for the count of five, hold for a few seconds then take a slow deep breath out for the count of seven. 6) Eat healthily and exercise. Eating a good nutritious, healthy and balanced diet will help to reduce your stress. Also try to include some moderate forms of exercise a few times a week, a brisk walk in the country or the park whilst observing nature is a great way to relax. 7) Avoid overworking and making unrealistic deadlines. We all have to work and get things done to pay the bills and keep the upkeep of our houses and possessions. But try to spend as much leisure time with your family and friends, make more time to do the things you like doing. Do not push yourself or convince yourself you have to to get everything done in a hurry, slow yourself down a bit. Try not to work too many hours if possible because you need to avoid burnout, do things at a sensible pace. 8) Change the way you respond and view situations. If you're running late or you have a problem or your stuck in a queue then getting all worked up or angry will not help the situation but it can be bad for your health and well-being. To change the way you respond you have to accept your current situation and try to relax and put up with it. 9) Stop and be mindful. Anytime you find yourself starting to respond stress-fully be mindful of what's going on, stop and pause for a few seconds, relax your shoulders and body and take a few slow deep breaths so you start to change the way you respond. 10) Relax yourself before you enter a challenging situation. Any time you have to face a stressful situation practice performing some slow rhythmic breaths before this will train your mind and body to relax in these situations in the future. Also, you can try to imagine yourself being calm, cool and relaxed before you enter the situation. 11) Imagine yourself in a peaceful location. If you begin to feel stressed, imagine yourself in a beautiful relaxing location, engage all your senses. If you start to feel overwhelmed, take a short break and get away from the situation until you calm down, do not carry on with what is making you feel stressed. 12) Accept things go wrong. Get out of the habit of blaming everybody else when things go wrong, try to be more tolerate to other people, except sometimes people are different. Take any criticisms as an opportunity to improve yourself, avoid jumping to conclusions or making things up to suit your own beliefs and idea's. Everybody is entitled to their own opinions and ways of living, try not change people to conform with your views or ways of thinking. 13) Herbs and Vitamins. There are many supplements that you can take to help you cut your stress, a lack in the vitamin B group can lead to anxiety issues, fatigue and it can make stress worse. A depletion in your magnesium levels may lead to raised blood pressure and feelings of fatigue. Omega-3 fish oil can help in brain functioning and mood regulation. Some herbs that may help to relax as you are. Valerian and camomile tea. 14) Cut back on stimulants. Try and cut back on stimulants, like caffeine, to much sugar, alcohol and smoking. Taking a short power nap once or twice a day is a better option than overdoing the caffeine.